From power stations to factories, thermostats to smartphones, information to entertainment, the world is driven—and controlled—by digital technology. So it's no surprise that political and economic success, for businesses and nations, depends on how current they are with advances in technology. That's why Bhaskar Chakravorti and colleagues at the Fletcher School have created the Digital Evolution Index, a first-of-its-kind map of how, where and at what speed the use of digital technologies is spreading across the globe. "The transformation from the physical world to the digital world is a profound change that we're all experiencing at every stratum of society in every part of the world," says Chakravorti, senior associate dean of international business and finance at the Fletcher School and executive director of Fletcher's Institute for Business in the Global Context. "And many places are not converting to this new world fast enough, which can limit a country's ability to compete economically and to efficiently govern its people. This affects their position and well-being in the world community." Chakravorti—along with Christopher "Rusty" Tunnard, a professor of the practice of international business; Ravi Shankar Chaturvedi, a research fellow at Fletcher's Institute for Business in the Global Context; and student researchers—have also written a report, "Digital Planet Report: Insights from the DEI," to accompany the index. The project focuses on 50 countries, half so-called advanced countries and half developing countries, evaluating their digital "maturity" and ranking them on their digital chops. Leading the pack is Singapore. It ranks highly on four main areas encompassing the more than 80 different variables that the Fletcher team deemed critical: it has a well-developed digital and business infrastructure, its consumers have the education and finances to engage in the digital environment, its government and institutions facilitate creating digital systems for both commerce and social tasks, and innovation is encouraged and supported in both the private and public sector. The researchers analyzed the course each country has taken since 2008, using public databases maintained by the Emerging Markets Private Equity Association; the World Bank; the World Economic Forum; the International Monetary Fund; Ipsos, a global market research firm; and others. Profile data for individual countries have come from the countries' own public records and sources including the Economist Intelligence Unit, LatinLink and the Global World Index. "In analyzing this data, you realize that digital transformation is a very complex thing—there are so many sociopolitical forces that play a role, in addition to technology, innovation and money," Chakravorti says. "We have reduced very complicated information into a single number so that we can see larger trends at work." Still, a single-number ranking can only illuminate so much. In particular, Chakravorti's team has found that rankings tend to obscure interesting patterns in how countries' digital presence has evolved, and how quickly the evolution has taken place. "No one has a monopoly on the pace of change, so in many cases, developing countries are leapfrogging forward faster than the developed world," Chakravorti says. Because of that, each country, in addition to being assigned a numerical ranking, is grouped into one of four categories that reflect the current state of growth. The top 12 countries that comprise the "stand out" category, including Singapore, Sweden, Hong Kong, the United Kingdom, Switzerland and the United States, have historically achieved high levels of digital transactions and continue to maintain that standing. Another dozen, including China, Malaysia, Mexico and Thailand, are "break outs." They have low but rapidly growing scores. "Watch outs" like Russia, Indonesia, Saudi Arabia, Egypt and Spain have great opportunities to advance, but also face substantial challenges in terms of government support, technological infrastructure or consumer use of the digital world. Finally, there are the "stall outs," which include Japan, Finland, Germany, France and the Netherlands. They have a history of strong growth that is withering away, putting them at risk of slipping in their digital development. The index redraws the map of global power balances according to completely new criteria, says Chakravorti. 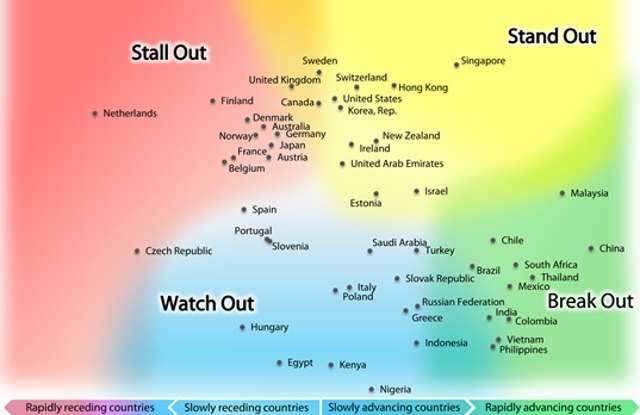 "This global overview will help predict how the economic and trade dynamics around the world may look in the future, and, if individual countries want to become more competitive in a digital ecosystem, determine what they can do about it," he says. How digital technology is affecting countries' positions in the world has become a hot topic since the index and report went public last fall at the World Retail Congress in Paris. The Fletcher team's work has been written about in more than 120 newspapers and other publications in 20 different languages. When Bill Gates heard about it, he tweeted it to his 20 million followers. Opening these new lines of communication is just what Chakravorti wanted. But not everyone was pleased. When the Netherlands saw that despite its number 10 ranking, it was classed as a "stall out," its government roundly rejected the report. "Policymakers and executives in different countries have now picked up on our study and are seriously considering it," Chakravorti says. "That the Netherlands rejected our study is wonderful—as an academic institution we are having international impact in shaping political and policy debate." Indeed, policymakers in a variety of other countries, from Ireland to New Zealand and corporations in the Philippines and the U.S., are using the study results for executive decisions. Now that Fletcher has a global overview, research will continue and focus on deeper analysis of individual countries and regions to determine more specifically what forces move countries ahead in applying and having access to the new digital world, Chakravorti says. "We are first looking at the ASEAN region of South East Asia. These countries— Singapore, the Philippines, Indonesia, Malaysia and Thailand—all are very dynamic digitally, and there seems to be a neighborhood effect in terms of how the region is progressing," Chakravorti says. "This will provide us with a good model for both individual countries and how countries interact within regions." It's no wonder then, Chakravorti reports, that the DEI has been called by one commentator "a new map of the world." Are digital currencies the future of money? Just wait until these digital freaks discover the world of linear systems!